For New Year’s Eve (NYE) I have decided to try a different look this year. 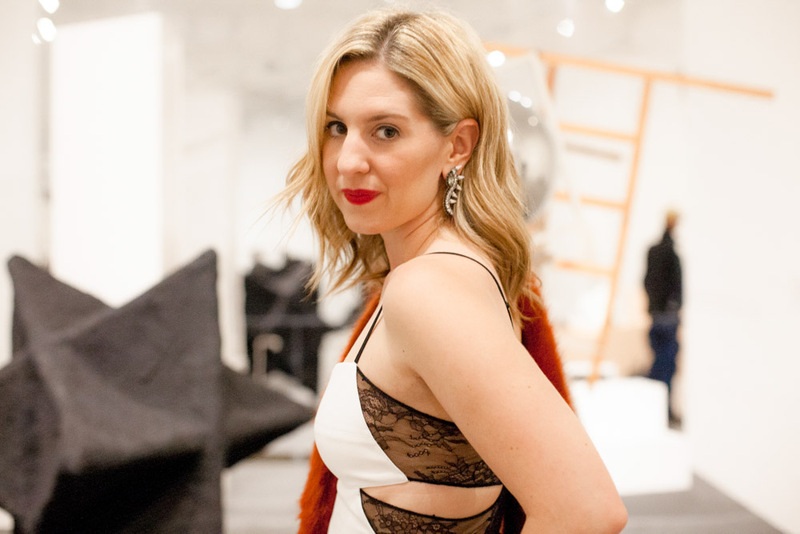 Normally I pick sequins because I love any excuse to wear them, but this winter I have been feeling black and white and when I saw this camisole I knew it was the perfect look for NYE. This camisole is glamorous and provocative while still being tasteful. However I personally consider wearing this top a fashion risk for me showing skin. I think NYE is a great evening to take fashion risks. Everyone is in a festive mood, celebrations are decadent, so why not take a risk? It’s a great way to be out with the old and in with the new! Whatever look you choose for NYE, I would encourage you to take a risk this year and have fun with your look! Lingerie was a prominent style seen on the runways for spring 2016. 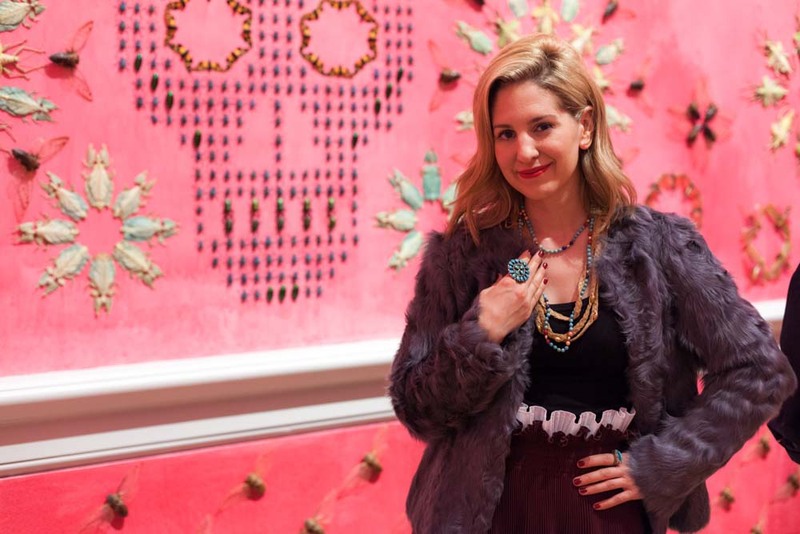 In fact I talk about this trend in the BYT 2015 DC Fashion Roundup I was featured in this past week. I think when ringing in 2016 it will be apropos to be embracing a 2016 fashion trend. A lacy camisole is a classic piece of clothing to own. While lingerie looks come in and out of style, a camisole can always be a great item to have in your closet. This is a versatile piece that can also be worn under suit jackets for work and then transition to an evening look, with jeans for a concert or date night, or with a skirt for a cocktail party. After tonight, I will primarily be wearing my camisole more frequently under blazers for a more modest approach. 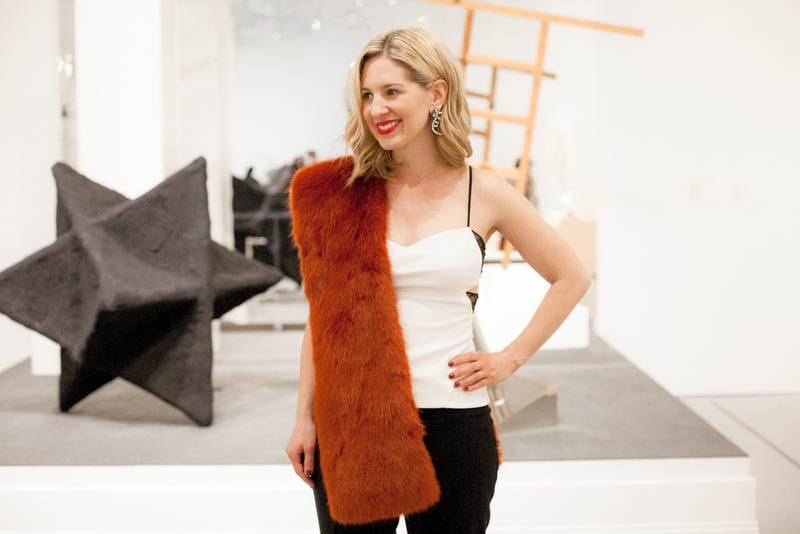 Photo Information: Photos taken by Anna Meyer at the Hirshhorn Museum. 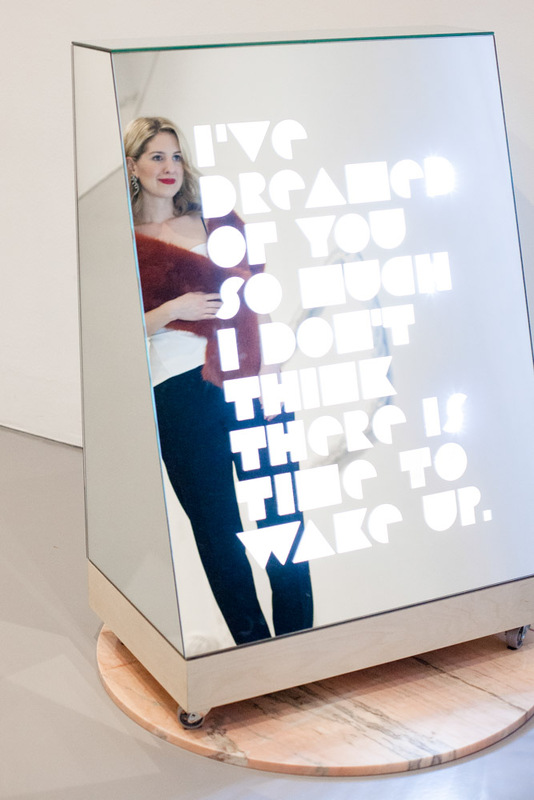 This collection is by Shana Lutker, Le ‘New’ Monocle, Chapters 1-3 and showing until February 15, 2015. Moncler was founded in 1952 and re-launched in 2003. The origins of the brand are French, but their products are now produced in Italy. Moncler is a luxury brand specializing in the everyday needs of people, specifically outerwear, and calling upon some of the most experienced mountaineering experts to develop their technology. Developing their products with the advice of scientific experts is why Moncler products are some of the warmest garments around. Additionally, Moncler takes fashion seriously and designs some of the most flattering, innovative, and beautiful coats. Moncler has taken the puffy coat, a very boring and usually unflattering item, and made it fashionable and desirable to wear. DC weather hasn’t required me to wear this coat too many times yet this winter, but it seems like the weather is changing and I will be pulling this coat out of my closet more frequently in the near future. I spent a lot of time debating if I should buy this coat a couple of years ago. I knew that I was freezing all of the time and that other coats weren’t cutting it. I also wanted to look professional and have a coat that was flattering, which is a little challenging to acquire when you are wearing a puffy item of clothing. After searching endlessly for the perfect coat, I kept coming back to this one by Moncler. By some miracle I got this coat on sale from Neiman Marcus. Moncler doesn’t often go on sale, but I aim to buy most things on sale and stalked this coat until it did. I could have settled on a few others coats and saved money, but ultimately I wouldn’t have been satisfied. I used to think splurging on a puffy coat was insane, but after owning this one I can say it has been worth it. I have worn this coat so many times and I think the cost-per-wear is finally working itself out. 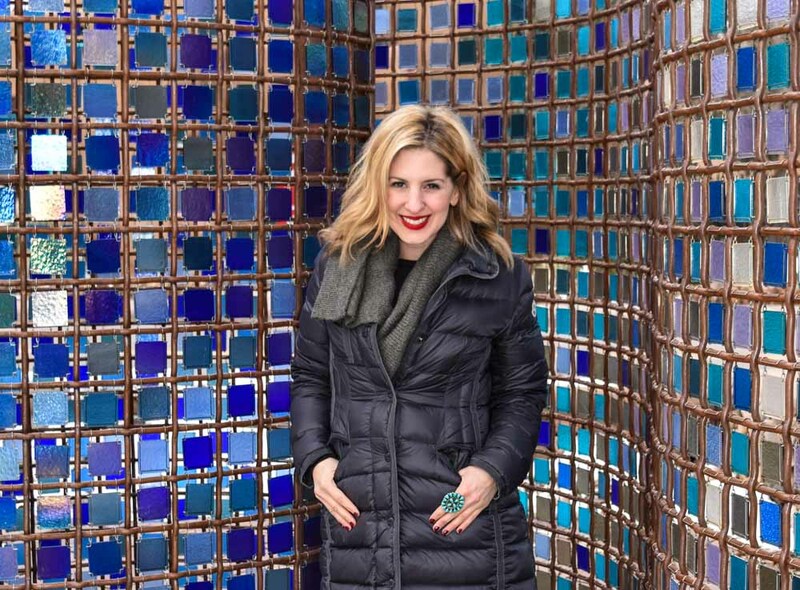 There are definitely other brands of coats that will keep you warm and that can be just as flattering, but I always include Moncler as one of my top recommendations. Some other brands I like include: Arcteryx (City Center DC); NorthFace (Georgetown); J.Crew (Georgetown); Uniqlo ; SAM; Burberry (City Center); Marmot. I traditionally recommend brands that spend time researching the technology of the coat, to make sure you are actually getting a coat that will keep you warm and not just something that only looks stylish. Mostly REI will carry a brand that has the best technology. That said, they may not pickup the most stylish pieces. Wearing a puffy coat has become very on trend, so you should spend time finding the most flattering version for you. Puffy coats now have oversized collars, angled closures, belts and cinches, and details like leather or fur trim that can make them much more dressy for work and evening events. These details also make these coats more flattering and appealing to wear. -Darts and cinching can allow for you to have a figure when wearing a puffy coat. Look for styles that have shape and aren’t overbearing. -Add a belt for shape, this is a simple and cost-effective trick for looking a little more stylish and having the coat look more flattering. -Choose a neutral, dark color and avoid super shiny fabric if this is the coat you plan to wear everyday. I’m all about being adventurous with fashion, but for most settings, you will want to be understated. -Dark colors are also the best colors because they hide spills and dirt. If you are a city dweller who relies on public transportation, including on-demand ride services, you may get dirty. A darker color hides this dirt well. -Photograph yourself in the coat. You can have the sales person take pictures or selfie at home upon delivery. You can instantly tell if you look like the Marshmallow Man from Ghostbusters this way. That look should not be your goal. -Avoid labels. Unless you are Chief Keef, you don’t need people to know you have “spent 4 bands on a coat.” Labels are detractors and unnecessary for the most part. I hate a label, I prefer my own individuality taking precedent to a brand, no matter how much respect I have for a designer. 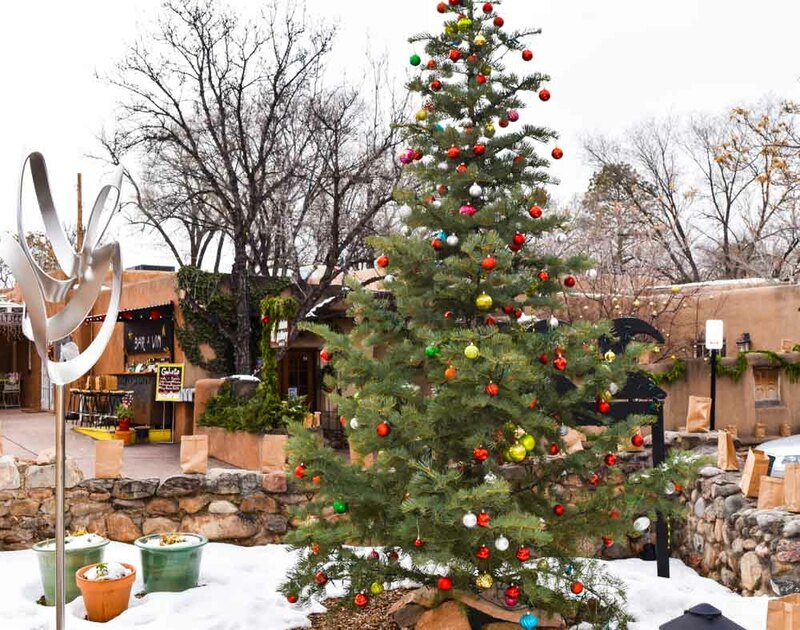 Spending Christmas in Santa Fe with my family is one of my most treasured traditions. As I mentioned in my last post, visiting the Farmer’s Market on Saturdays and getting tamales, cheese danishes, and Whoo’s blue corn lavender donut is a highlight of the time that I spend in Santa Fe. One of my other favorite places to visit is Canyon Road. 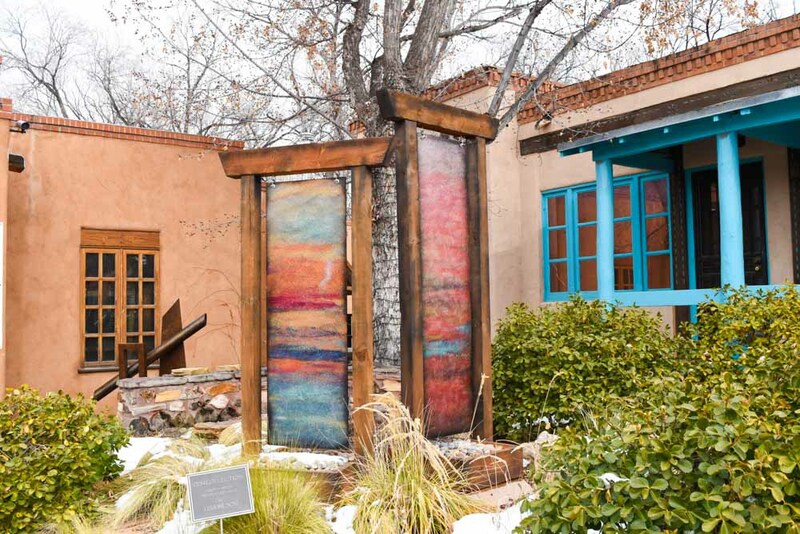 Santa Fe is known for their art and artistic influence. 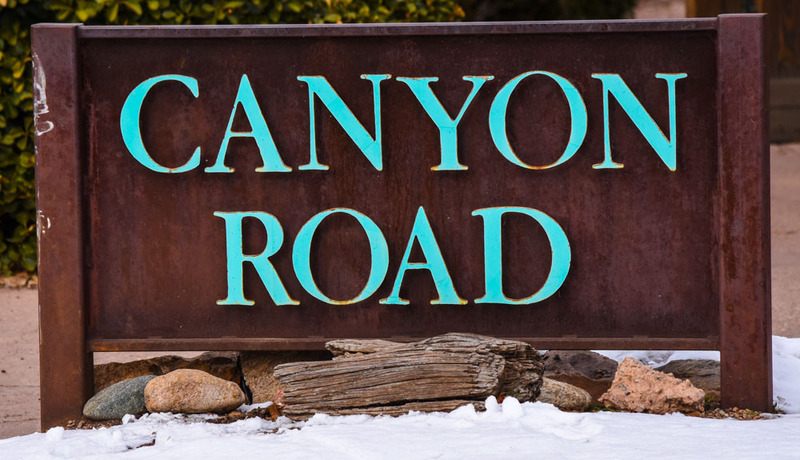 Canyon Road is the most renowned location to find art. There are over a hundred galleries on or surrounding Canyon Road featuring local, national and international artists. Native American and Latino art has a prominent role in the galleries along the road, but you can also find regional, folk and contemporary art there as well. Christophe Sauvat Poncho styled with Sweater from J.Crew; Jeans by J. 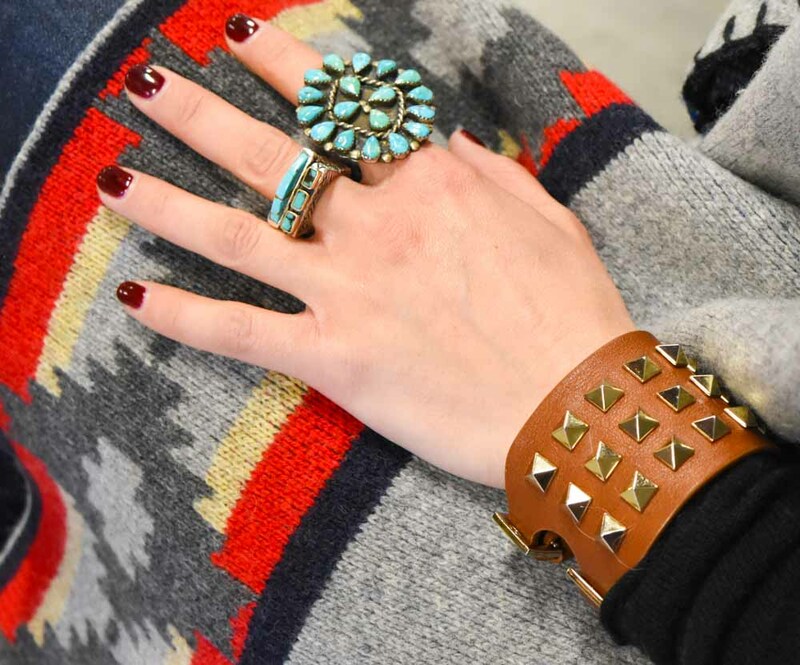 Brand; Shoes by Sam Edelman; Bracelet by Valentino; Rings from Santa Fe. I spend every Christmas with my family in Santa Fe, New Mexico. Santa Fe is one of my favorite places in the world. 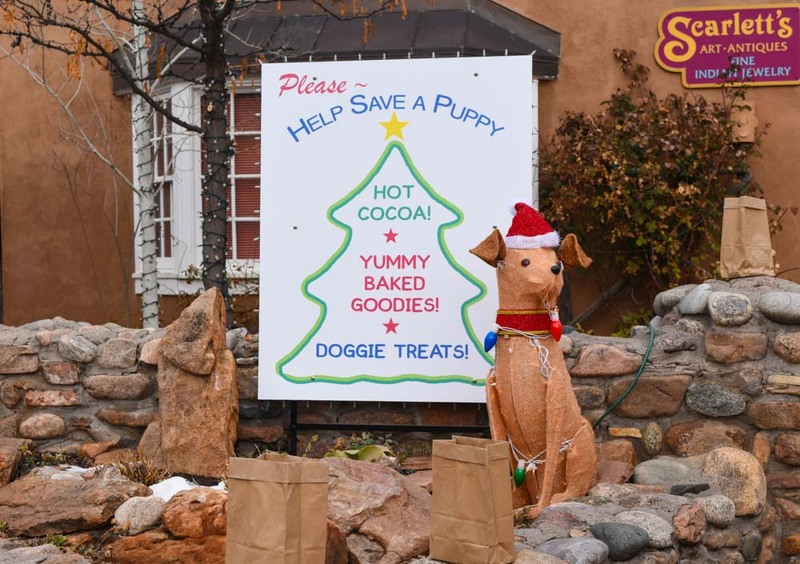 The elevation of Santa Fe is 7,199 feet, so it is normally really cold and snowy during the winter. 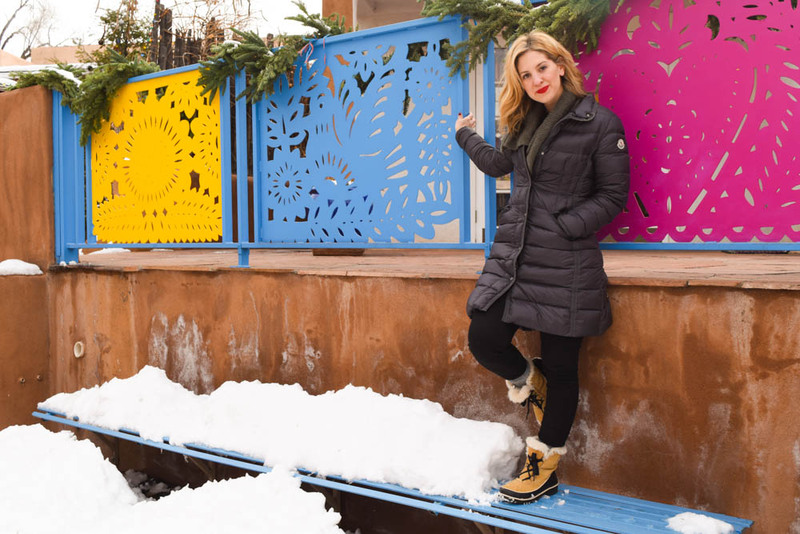 It’s a peaceful escape from D.C., but certainly not a warmer one. 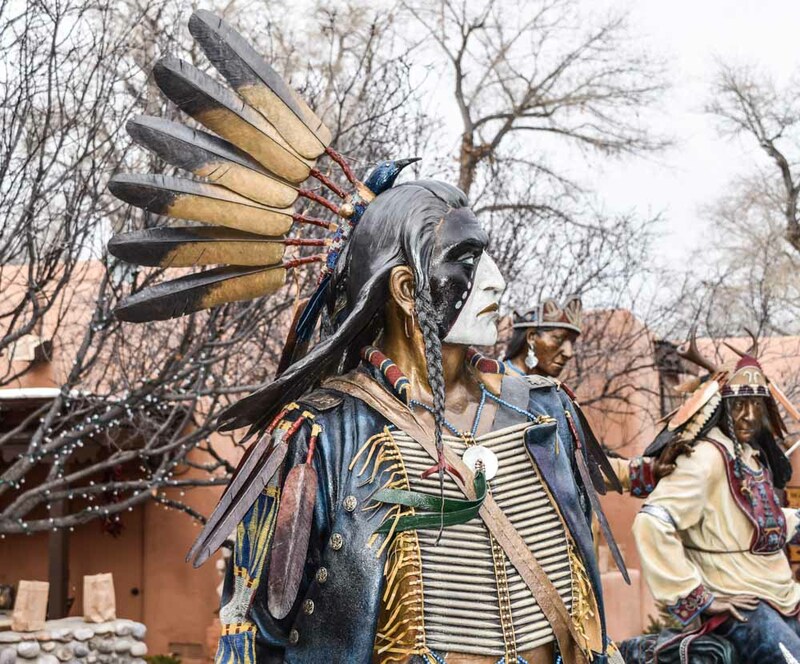 The culture in Santa Fe is extremely diverse and heavily influenced by Native American and Mexican tradition. There is also a major art and artisan community here. A wealth of talented painters, sculptors, jewelry designers and textile makers all live and work here. Its a very low-key place with a lot of people living here who care deeply about their environment and craft. New Mexico also has a large agriculture community, being most famous for their chilies. All of these influences are represented at one of my favorite places in Santa Fe, the Santa Fe Farmer’s Market. 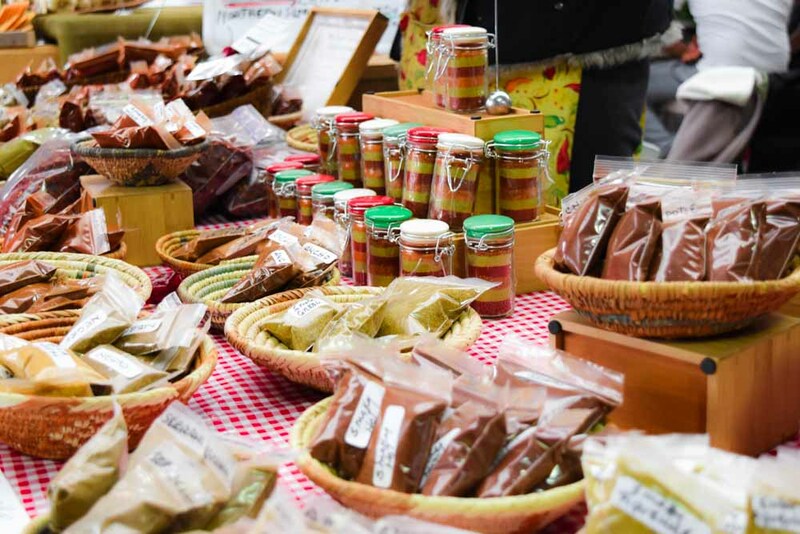 The market normally takes place every Saturday with vendors from around New Mexico and surrounding states. 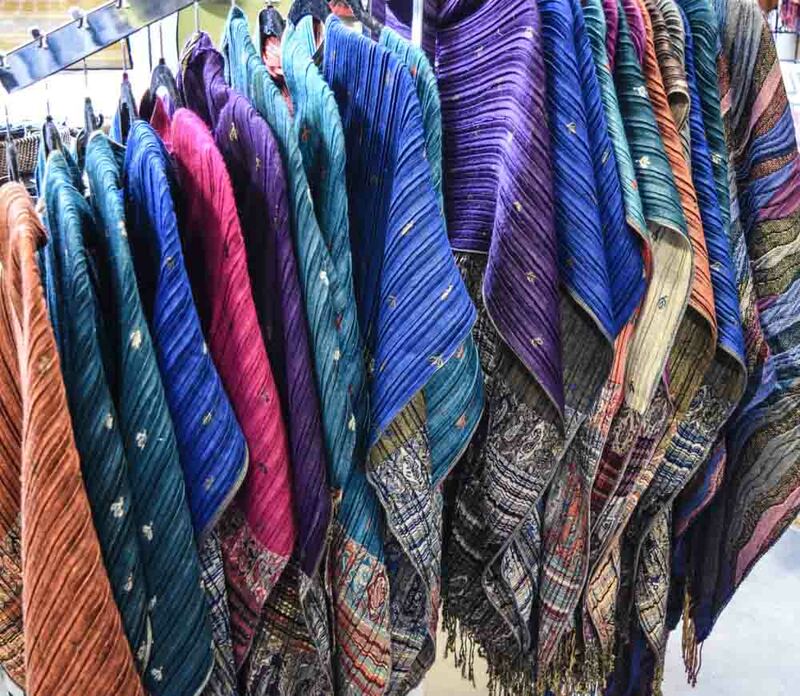 Everything from produce, baked goods, jewelry, homeopathic remedies, and brightly colored wraps and textiles are sold at the market. For Christmas, they had a special market on Tuesday so folks could get last minute gifts and food for the holiday. 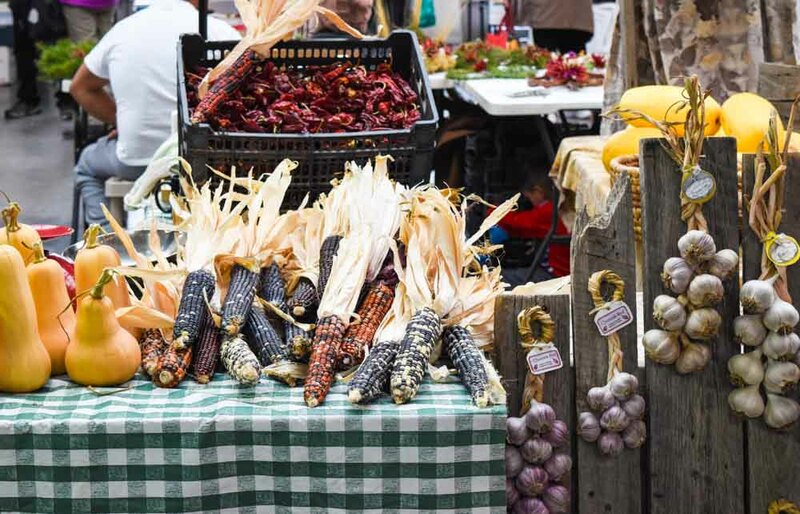 “The market that began with a handful of farmers in the late 1960s is now New Mexico’s largest farmers’ market and one of the most widely recognized markets in the United States. 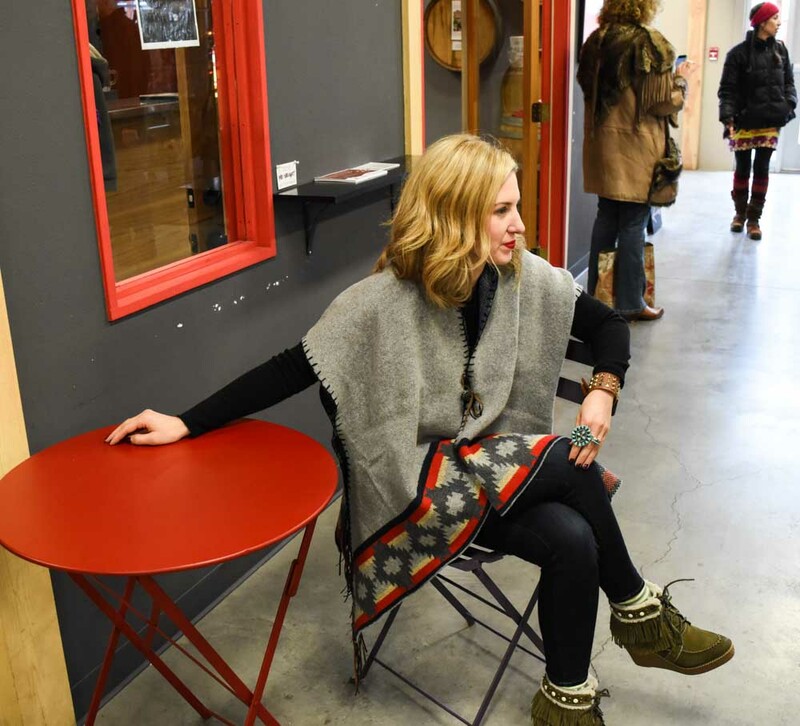 DeNada knitwear is designed by Virginia Arrisueño in D.C. and handcrafted by artisans in Peru. Virginia travels to Peru twice a year to work with the makers of her items to ensure that they are made at the highest production level. 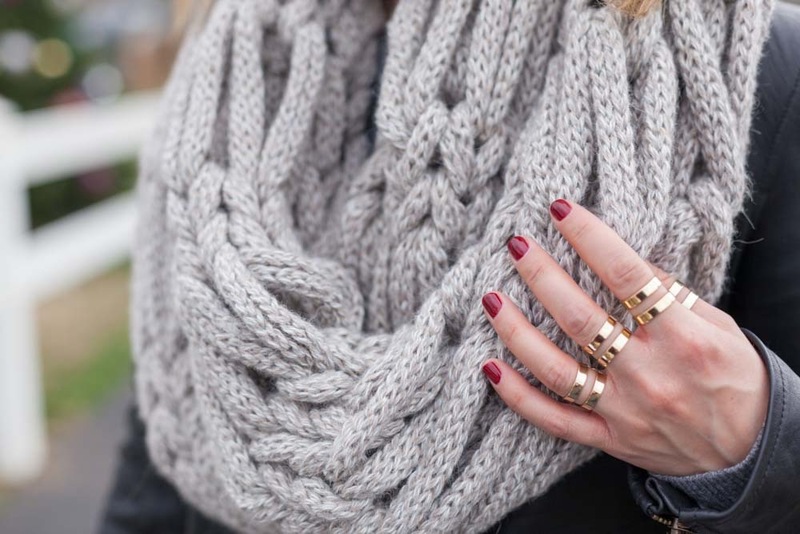 The scarves are made with alpaca, which makes them extremely soft and comfortable for wear. You can learn more about the production of DeNada by watching this gorgeous video on the DeNada site. I have never come across knitwear designs as intricate, high quality and fashionable as DeNada. Perhaps Missoni, which is like comparing apples and oranges except when it comes to craftsmanship, but the DeNada pieces are actually much more universally flattering and obtainable. Every piece of the DeNada collection is so understated cool, but rich with texture and quality. The DeNada pieces make a very simple outfit, like the one I am wearing in the photos above, look like you are an off-duty model. Seriously, I can’t say enough about the coolness of Virginia’s designs. The designs are also very practical. Men and women can both wear these pieces and look extremely sharp. The designs are easy enough to wear for work or on the weekends, but fancy enough to be worn out to an evening event for that chic something extra. It was at a fundraiser for the DC Public Library Foundation back in September that I met Virginia for the first time. She was in her element, showing women and men how to wear her beautiful designs as her husband and son looked on in support and with great admiration of her. 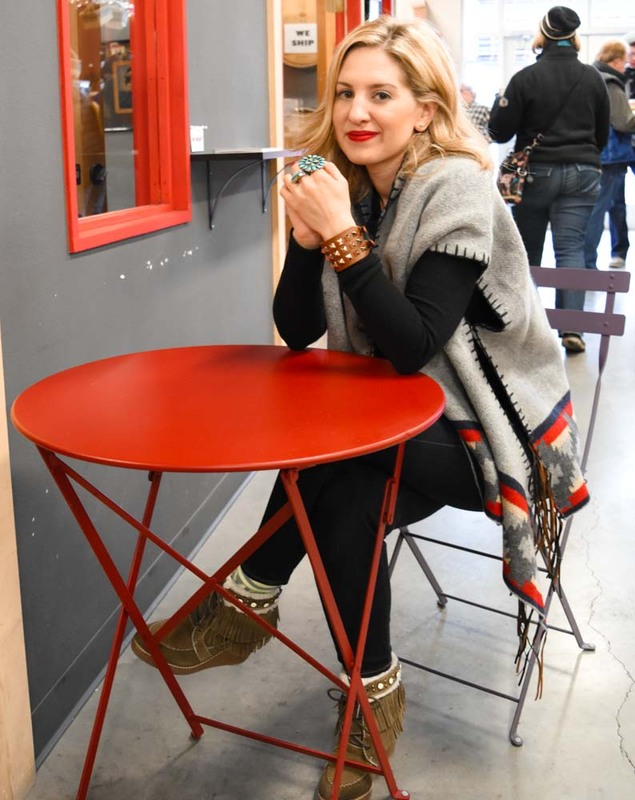 Virginia would take time with every customer to make sure that they knew the many ways to style her pieces and to make them look amazing on each individual. I admired her kindness, genuine desire to make people feel great when wearing her designs, and her Boss Lady work ethic. It was on that evening that I purchased this beautiful scarf and couldn’t wait for the time I would feature DeNada on Politiquette. With the spending bill finally passed, holiday parties finally simmering down and Christmas 4 days away, today seemed like the best time to feature DeNada. I think people are ready to be cozy and in the holiday spirit after a long year. I also have a feeling that people need LAST MINUTE CHRISTMAS GIFTS. DeNada would be the perfect gift for friends and family. I actually stopped by the DeNada studio last week to pick up multiple Christmas gifts for my family (and myself). 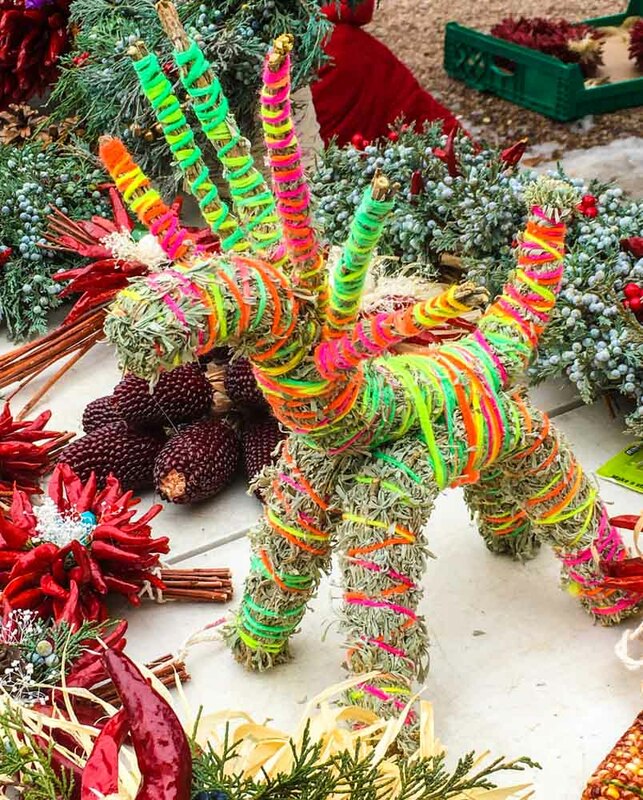 If you want to pick up some of the DeNada collection for gifts, you can visit the Downtown Holiday Market until 12/23 from 12pm-8pm. You may even be lucky enough to meet Virginia at this location. Photo Information: Photos taken by DC photographer Bobby Spero at the The National Christmas Tree. I learned of DeNada from one of DC’s most prominent, emerging artists who is also the designer behind my sassy lady purse blog logo, Kelly Towles. Kelly happens to be married to Virginia, making them one of the most artistically gifted couples I have encountered in D.C. I feel like the universe stepped in and gave me a great present leading me to meet these two. In addition to supporting my idea to begin publishing Politiquette, they also were kind enough to introduce me to the photographer who took the photos featured in this post today, Bobby Spero. I have a great amount of gratitude to Virginia and Kelly, especially because I don’t know either of them very well yet they have always been gracious and encouraging. They really want to help emerging creatives succeed and as busy as they are, neither sleep as far as I can tell, they make time to help other artists and give back to the D.C. Community in various charitable ways. This skirt is from the No.21 resort 2016 collection and I purchased it from Forward by Elyse Walker. I used to lust over Alessandro Dell’Acqua’s eponymous line while he was officially engaged (the line began presenting collections in 2009 without his approval per a press release he sent to notify industry), so imagine my surprise when I learned that a new line I had also been lusting for was Dell’Acqua’s new-ish fashion endeavor. No.21 was founded in 2010, but only recently has it shown up on every internet shopping site I frequent. The designs from No.21 are very fresh, with Italian bohemian femininity mixed with menswear inspired cuts. His line definitely includes elements of another favorite and easy-to-wear designer that I love, Isabel Marant. No.21 was named for Dell’Acqua’s favorite number and birthday. I spend every Christmas in Santa Fe, New Mexico with my family and this year I especially can’t wait to be there. In the Midnight Garden an installation by Jennifer Angus at the newly re-opened Renwick, uses southwest hues and includes Dia de los Muertos skull shapes made out of real insects. This installation reminds me very much of Santa Fe culture and style, due to the many individuals in New Mexico with Mexican heritage, and I realized a visit to the gallery could be a quick fix to be in my happy place until I get out west. To visit this exhibit, I decided I would find a way to combine DC and Santa Fe style; here is the outfit I came up with. 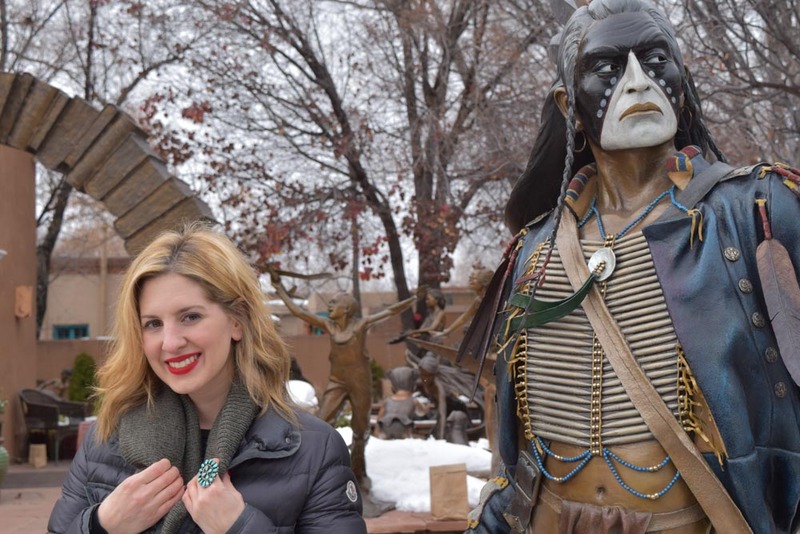 I picked desert inspired colors (my skirt), neutrals and added a collection of turquoise and leather jewelry that I have acquired over the years from visits to Santa Fe. I wore this exact outfit, along with this bright blue fringe Gucci bag, to the fancy Gucci grand opening event at City Center this past week. If I had been in Santa Fe, a lot more fringe, beading and outerwear would have been necessary, but for DC this was the perfect mix of classic and understated boho. I love mixing runway and artistically inspired elements into my daily fashion. In order to be taken seriously in DC, I encourage you to mix these various elements with classic daily pieces, i.e. a black suit, to have a little more fun with dressing. This is a very appropriate way to be tastefully styled while maintaining more creative elements of fashion important to your identity. 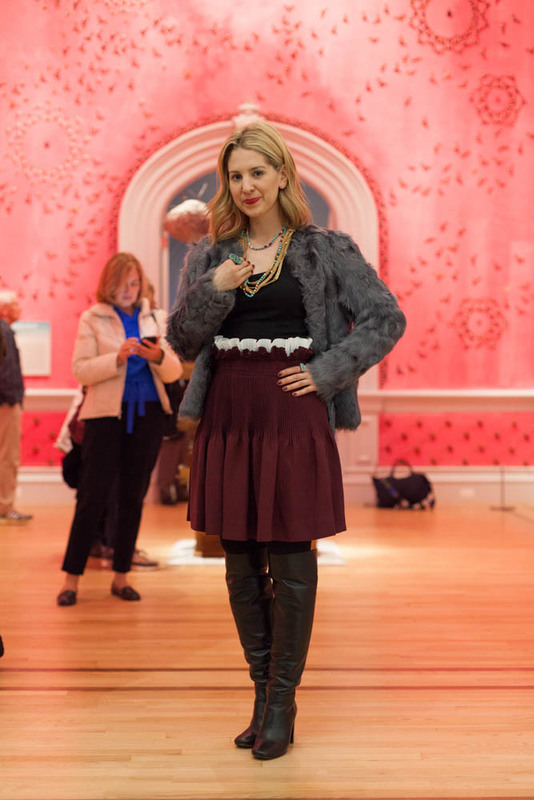 Photo Information: Photos taken by Bobby Spero the Renwick Gallery.